Syracuse University Chancellor Kent Syverud announced last week that SU won’t make a public commitment to not invest in private correctional facilities despite calls from the University Senate, Student Association and Graduate Student Organization. In a September letter addressed directly to Janice Dowell — a professor in the College of Arts and Sciences’ philosophy department who has spearheaded calls for the divestment commitment alongside a group of faculty — Syverud said the university wouldn’t make a public commitment to not invest in private prisons. “Given our robust socially-responsible investing policy and practices the Committee will not make public declarations about any individual prospective investment, including — but not limited to — private prisons,” Syverud said in the letter, which Dowell said she received about 30 minutes before the Sept. 5 Senate meeting. 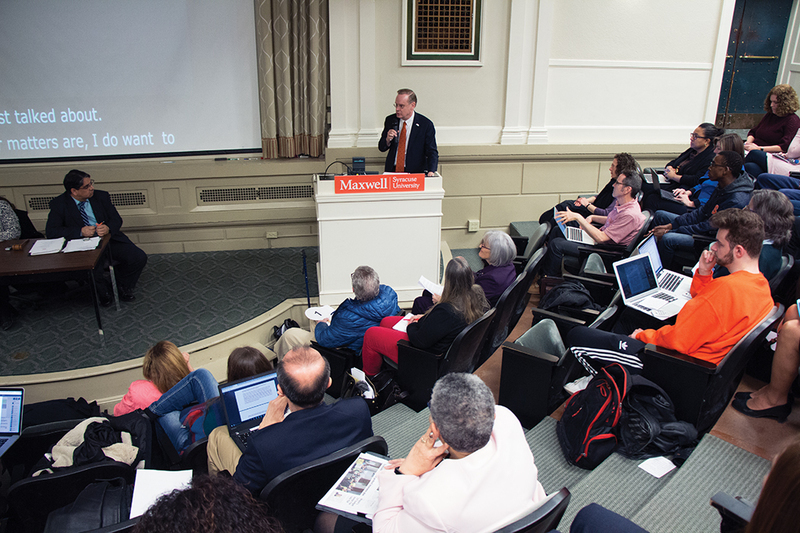 The group of faculty raised concerns over the treatment of prisoners and the role they say private prison facilities play in contributing to racial and economic inequality. They initially asked the university if it had any direct investments in for-profit prisons, specifically whether or not the university endowment owns stock in a major facility operators such as CoreCivic or The GEO Group. University officials told the group that SU has no direct investments in private prisons or their suppliers, Dowell said. Syverud reaffirmed the university officials’ statements in the letter last week. But Dowell said she believes the public commitment to divestment could encourage other universities to divest as well. “We’re not just hoping our university will commit to divestment, but that in addition they’ll do so publicly so that we can inspire other universities and entities that have large endowments,” she said. Dowell said all three resolutions by the university’s shared governance bodies were passed by wide margins. After the resolution was passed in the Senate, the vote moved up to SU’s Board of Trustees. The board considered the resolution, but rejected it in May and would not agree to make a public statement, Dowell said. The group has asked for the board to revisit the issue in the fall, and to allow someone from their group to give a brief presentation on for-profit prisons. Both of those requests were rejected, and the earliest the university will consider to revisit the issue is next summer, Dowell said. “Because of the lack of such direct investment, Syracuse University’s current endowment has minimal involvement with private prisons — and that minimum is by and large through index investments that would be imprudent to unwind,” the letter said. SU’s endowment is supervised by the Investment and Endowment Committee of the Board of Trustees. SU’s 2017 endowment was roughly $1.2 billion.